Vaporstat at the End of the Main? Here's my issue. I recently had installed a new boiler on a Dunham vapor system, and it all works fine, but the 0-16 oz. Vaporstat, which is mounted right on the boiler in the usual way, is causing it to short-cycle shortly after startup. I know it's the Vaporstat, which is currently set at 10 oz., because I can hear the switch clicking. It is my belief that the pressure at the boiler is building so fast that it switches off, even though the rest of the system is not yet up to pressure. I opened the vents at the end of the two return mains to see if I could reduce back-pressure, but no luck. 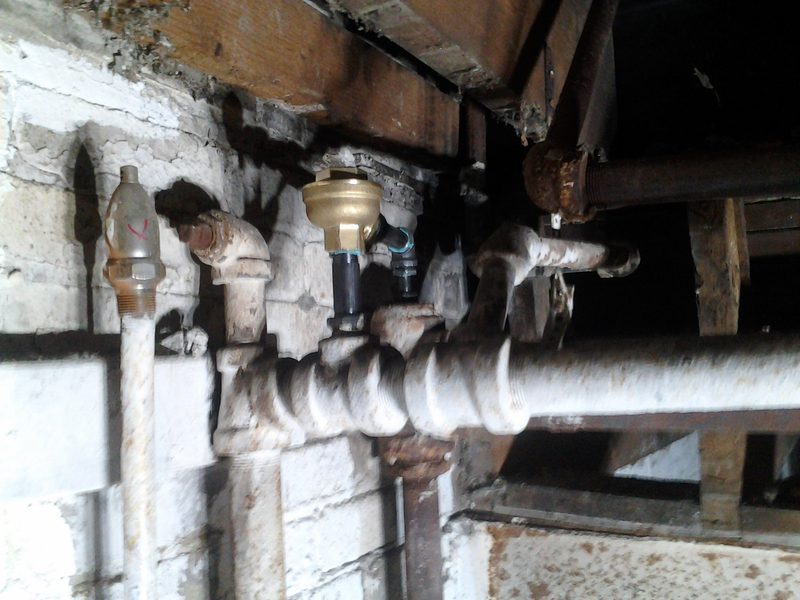 And when I say opened, I mean opened the pipe where the old Dunham separator/vents would have been (two supply mains with crossover traps to two return mains, with a vent at the end of each), so I have two open 1/2" pipes at the end of each return main. For the crossover traps I used B&J 122a, since they have a decent capacity. My only thought now is to put the Vaporstat near the end of one of the mains, perhaps wired in series with a standard Pressuretrol set at 2# on the boiler (just to keep the less sophisticated future service tech happy). Has anyone had any experience with this sort of issue, or controlling the pressure from the mains? Have you verified that the vaporstat is working properly? Also, you bullheaded the equalizer/system takeoff. You’ll want to avoid that on future installs. Your problem is exactly why the vapourstat on Cedric is mounted on the header, not the boiler. The header was drilled and tapped to take a standard brass pigtail, and the vapourstat and low pressure gauge were mounted on that. If the pressure is still bouncy at the header (and it may be) you can put a snubber in between the pigtail and the vapourstat. The problem with the end of main location is that there is a considerable pressure drop in the main which you would have to figure in to properly set the vapourstat. I didn't personally install the boiler, so I have no guilt as regards that equalizer location - although it's a good point. The surging in the boiler - and the general instability in the steam chest - is also a very good point. I should probably move that pigtail. I don't have a low pressure gauge on hand, so I can't yet check the pressure at the pigtail, but I suspect the Vaporstat is working as it should. The cycling is about every couple of minutes, not every few seconds, and it damps down once the system heats up. It also isn't a problem when it is first starting. It's only when it starts pressurizing the system that it begins. And it's not a terrible thing, since it stops once the system pressure stabilizes. It just offends my sensibilities to have it doing that. Because it's wrong! As far as system pressure drop at the end of the main, you either figure it out, or just set the pressure to one you like. Dunham expected the system to run at about 8 oz's., at the boiler, but that was an ideal average. One still has a bunch of leeway, plus or minus. I wouldn't feel bad setting it for around 4-6 oz. further down the line. 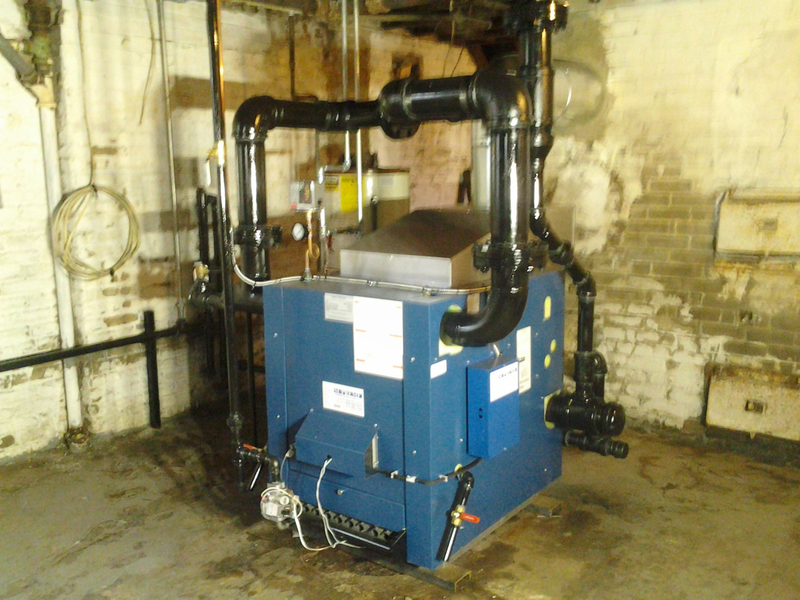 We install vaporstats at the end of supply mains around Cleveland all the time. It was and still is a common practice in these parts. The guys around here are more concerned with the pressure in the system than the pressure in the boiler. Was the boiler skimmed after install? If so it might still need more. Your description is odd. The short cycling should get worse as the system heats up not better. Does the boiler start short-cycling before the steam mains heat all the way to the end? If so, I'd change the B&J 122A crossover traps to Big Mouths. These have several times the throughput of 122As. How fast are you venting your radiators? I was originally venting them too fast, and the vapor was rushing across the radiators and flowing unevenly to other radiators. The goal on the steam system is to get metal hot and radiating. The radiating metal absorbs the steam and keeps the pressure down. SO oddly, venting radiators slower gets the metal hotter increasing radiator convection and ultimately transferring more heat because it gets hotter, and starts creating air movement. Radiators ultimately, are as much radiant heat as they are mini gravity convectors. A radiator that's 160F because vapor rushed across the radiator rather than 210F will have less airflow, so it's like you "turned off the fan". Again, my pressure was around 3-5oz then I slower my radiator venting by about 75% and pressure dropped like a rock and the system got more balanced. Pressure now registers 0oz at the boiler most of the time until radiators are fully heated. System starts heating faster too it seems. I had to raise it back up just a little because the vents were getting noisy on initial venting. It's a balancing act between boiler size, header size, and system EDR and header + riser/run out mass/length. How a system behaves when cool vs hot changes too. But all that being said, you need to keep increasing main venting to get initial start up pressure down. But after that, you need nice steady control to fully heat the radiators in a nice even progression. Too fast is as bad or worse than too slowly based on my observations. Yeah, Gerry, that's what I thought (perhaps because I was born and grew up in Cleveland). The boiler was skimmed and the waterline doesn't surge, which is another reason I think it's just pressure related. Gerry, anything special I need to know if I wanted to put the Vaporstat further out in the system? Nothing special. Just cut a tee into the system between the main and the main vent and install the vaporstat there. You still will need a pigtail loop for it. Almost forgot to say that. Before you do any of that i would make sure the vaporstat is actually working properly. Almost everyone I get isn’t accurate and requires adjustment. A good point. I should put on a 0-16 oz. gauge in addition to the compound gauge. I always worry a little, though, about whether such a gauge will be damaged when the system goes into vacuum. Pigtail is a given. it is a big boiler (don't remember btu's off the top of my head), but the house is probably close to 6,000 sq. ft. I did the radiation survey and that's what was called for. I've never seen a compound gauge with 55 wc on the pressure side. Who makes these?